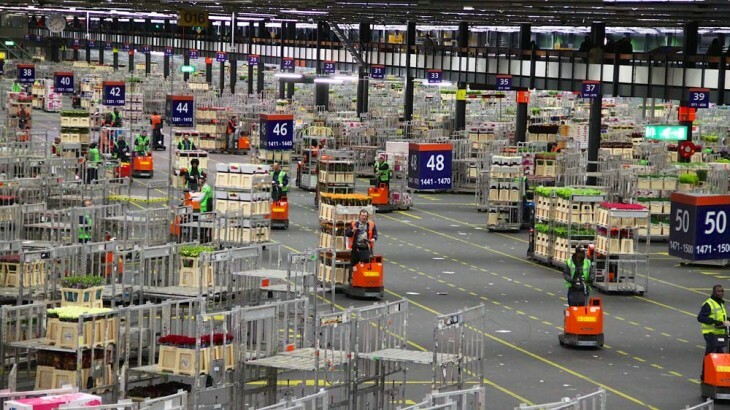 The FloraHolland flower auction in Aalsmeer near Amsterdam and Schiphol Airport is the largest floral market in the world and a fine study in logistics. The Aalsmeer flower auction in North Holland near Amsterdam Schiphol Airport is by far the busiest floral market in the world. Daily, around 20 million flowers are traded here. Visitors are welcome but must arrive early and only observe the action from walkways several meters above the flowers and the busy warehouse floor where mini transportation trains crisscross the world’s largest covered market at astonishing speed. Visitors can avoid disappointment by knowing in advance that the Aalsmeer flower auction is not Keukenhof. Visitors will not get up close and personal with the flowers – the most interesting aspect of the Aalsmeer flower market is seeing the logistics in action, rather than admiring flowers up close. 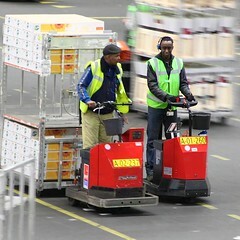 The flower auction held each weekday at the FloraHolland warehouse in Aalsmeer is the largest flower market in the world. 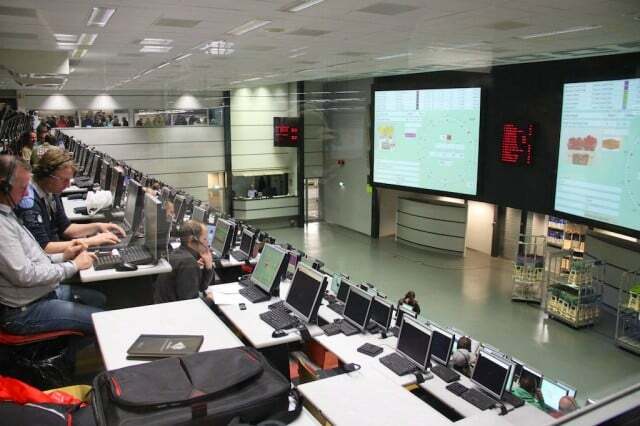 Daily around 20 million flowers and decorative plants are traded here with well over 12 billion flowers traded annually in the six FloraHolland auctions in The Netherlands. 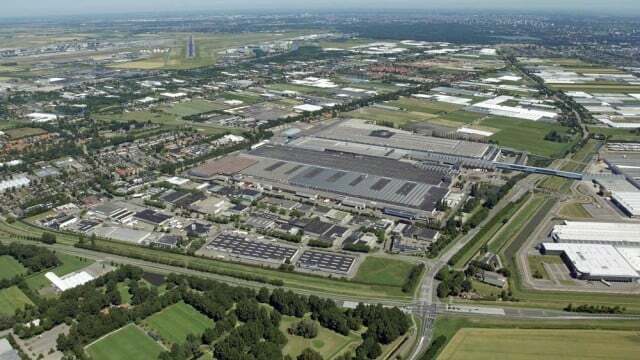 This enormous central auction building in Aalsmeer has the largest footprint (518,000 m²) in the world while its floor space of 990, 000 m² makes it the fourth largest building in the world. Inside, the building is a hive of activity. 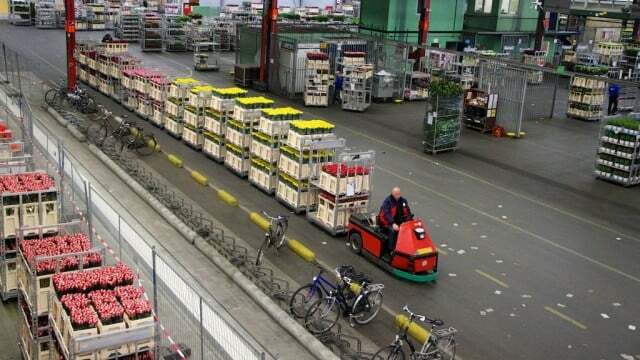 Endless numbers of small trains full of carts loaded with containers of flowers and plants are moved by electric-powered trucks or automated rails. It looks all chaotic with a highway system (and clearly a highway code to go with it) allowing the various wagons to be moved to where the schedules demand. 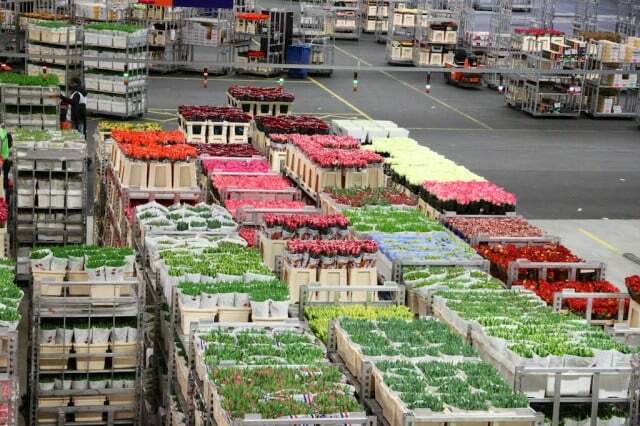 Flowers arrive from around 10 pm and is cooled and sorted during the night. The auctions are early morning with bought flowers distributed immediately. 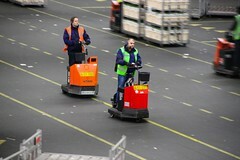 By late afternoon, all the flowers will have moved out and the warehouse prepared for the next round. Visitors to the Aalsmeer flower auction may study the activity from two elevated walkways high above the busy warehouse. These galleries are the closest visitors will get to the flowers – the flowers are the traded commodity here, not the tourist attraction as is the case at Keukenhof and the tulip bulb flower fields in the Bollenstreek. 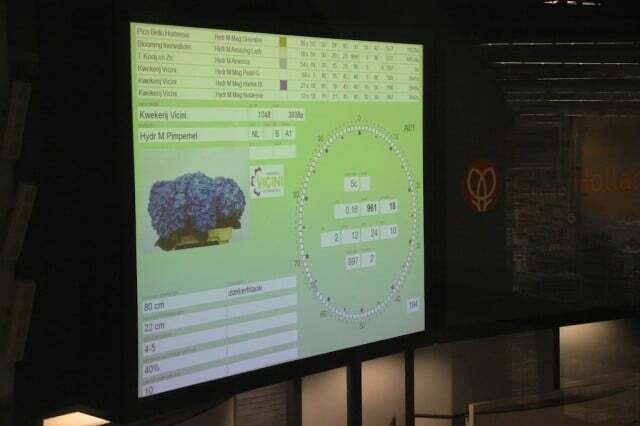 Tourists at the Aalsmeer FloraHolland flower auction (bloemenveiling) may observe the actual trading through soundproof windows high above two auction rooms. Here, two auctions per room are staged simultaneously. At other auction rooms usually not open to visitors up to seven auctions can take place at the same time. The trading itself is done electronically, so the auction room is actually fairly quiet, other than traders swapping gossip amongst themselves. In front of the hall, the flowers and plants are pulled through the hall on automated trains – two trains go by if two auctions are held at the same time. Huge screens in each half of the hall display the auction information – the clock determines the price. The auctioneer sit behind a glass screen – traditionally he drops the ball in each clock but nowadays most of it goes automatically. The buyers bid electronically as the flowers move by. Once sold, the most impressive part of the logistics springs in action. Wagons and containers are sorted and sent to the correct loading bay so each buyer receive his wares and can sped it on to the shops, further distribution centers, or often to Schiphol Airport for export. Payments are received the same day and all sold flowers clear the building by late afternoon. 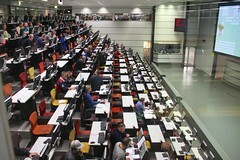 The flower auction in Aalsmeer follows the Dutch auction system – the price is set high and then drops until someone buys. If demand exceeds supply, those waiting too long for the price to drop may go home empty handed. Similarly, anyone buying too fast overpays but is at least assured of receiving the product. The bidding process can be seen on the large screens inside the auction room. The key element is the round circle – often referred to as the clock. A start price is set and the auctioneer drops the ball that moves down with the price dropping at the same pace – the numbers on the ring is percentage not currency. The ball stops as soon as a buyer is willing to pay the given price. If the buyer does not take all the flowers on offer, the price continue to drop until further buyers are found. The process can repeat but ideally every offering is finished in one go. Only a few seconds are spent per auction offer. The board is full of information but the most watched figure inside the ring is second from the top on the left: the price (prijs) per stem – usually in euro. Before getting excited at tulips at €0.10 per flower, note the ape (number of flowers per container) and the min-afn (minimum number of containers that must be bought). Only registered traders may buy anyway. Other information on the board includes the seller, details of the flowers on offer as well as the reliability of the seller’s quality indexing. The board also lists the next six auction offers that will follow. 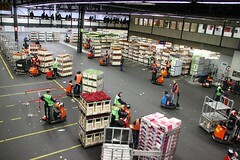 The FloraHolland flower auction in Aalsmeer takes place every weekday from 7 am to 11 am (only until 9 am on Thursday). Arriving early is advisable – preferably before 9 am (or 8 am on Thursday) – as the duration of the auctions can be shorter on certain days. Upon arrival, first follow the gallery all the way to the auction rooms and stop and admire the activity on the warehouse floor on the way back. The flowers will still be moved around for hours after the auctions have finished. Wear comfortable shoes – it is a long walk. Admission is €8 for adults and €5 for children 6 to 11. The galleries are accessible for wheelchairs and strollers. The FloraHolland auctions at Naaldwijk (south of Den Haag) and Eelde (near Groningen) are also open to visitors but hours are shorter and the auction halls much smaller. The FloraHolland flower auction market in Aalsmeer is easily reached by car or on public transportation from Amsterdam and Schiphol Airport. By car, use exit 3 from the highway A4 (Amsterdam to Den Haag) towards Aalsmeer. Follow the signs for “FloraHolland / Bloemenveiling”. Once at the auction center, follow the signs to parking lot P23 or “Bezoekers/Tourist”. Parking lot 23 is on the roof of the complex – park in the white (wit) zone. Parking is free. From the parking lot, take the elevator down to the ground floor and follow the “Tourists” signs to the adjacent building. The Aalsmeer flower auction can also easily be reached by Connexxion bus 357 (previously 172) – bus stop Aalsmeer, Bloemenveiling Hoofdingang (Floraholland) is directly at the Tourist Center entrance. The bus runs 4 to 6 times per hour – direction Kudelstraat via Amstelveen when traveling towards Aalsmeer and direction Amsterdam CS on the way back. Bus 357 (previously 172) takes around 50 minutes from Amsterdam Central Station and 40 minutes from Amsterdam Leidseplein to Aalsmeer, Bloemenveiling. From Schiphol Airport, the simplest option is to use bus 300 (direction Bijlmer Arena) to stop Amstelveen, Busstation and change here to bus 358 (direction Kudelstraat via Amstelveen). Traveling time is just over half an hour. Use 9292 for live timetables for all public transportation options in The Netherlands. For more options from Schiphol, check the walking maps at bus changes, as some stops are in different streets! Taxi2Airport quotes around €40 for a transfer from Schiphol Airport, driving time around 20 minutes. The Aalsmeer flower auction is a good excursion trip and due to the early start combines well with any day-trip schedule taking visitors south of Amsterdam to for example Keukenhof, Avifauna bird park, Gouda, Kinderdijk or Utrecht. It is also a great sight to see if on a long early morning stopover at Schiphol Airport. Some day trips, e.g. Get Your Guide, include Aalsmeer in excursions to other destinations in The Netherlands.